It was great to see the return of MIKE BARRY’s XXL BAND to FARNBOROUGH JAZZ CLUB (Kent) on FRIDAY, 1st July 2016.. I can’t believe it was back in February 2015 they last played here, but we do have all three of Mike’s band play for us (this one, plus ‘Uptown Gang’ and ‘Yerba Buena Band’). 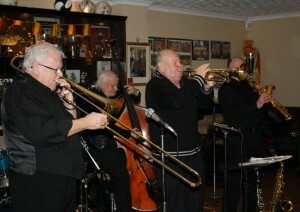 This band has obviously MIKE himself on trumpet, TIM HUSKISSON on reeds, LES HANSCOMBE on trombone, GRAHAM BARTON on piano, BRIAN STAPLEY on drums and TED SIMKINS on double bass. They can now be known as MIKE BARRY’s XL BAND because they, well Mike has lost one&half stone – Wow, how’s that? Well done Mike. So obviously, they played with a lot of energy, starting with ‘Canal Street Blues’, such a wonderful number to get everyone in the mood – yeah! ‘Beale Street Mama’ was another excellent tune to choose, I can hear Mike announcing it and finishing the title with the words “I’m Coming To Get You”… luv it. I have to say the whole band were brilliant when they played ‘Savoy Blues’. I particularly noted the front line boys playing beautifully in harmony. Another number to mention is ‘Washington and Lee Swing’. This is an old American high school football ‘fight’ song. It was also used in Red Nichols film, ‘The Five Pennies’, a film I probably saw in 1960’s and remember being absolutely excited by (gonna watch it again over the weekend!). Moving on … ‘Hello Central Give Me Dr Jazz’ sung brilliantly by Les. A tune enjoyed being played by most bands too. 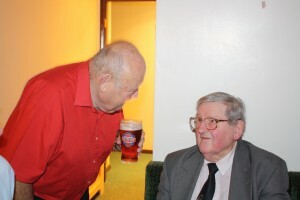 I had a wonderful dance – the cha, cha, cha, with Steve to ‘The Isle of Capri’. I just loved it, although I think it should have been a tango – ha. Oh well, we are so relaxed here, nobody worries. 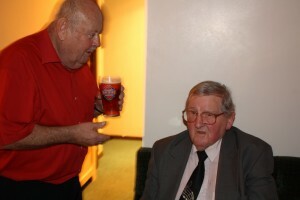 During the interval, I announced Colin & his wife Jo Dobson, were in the audience. Colin had been trumpeter for The Billy Cotton Band Show (of ‘Wakey, Wakey’ fame). It is to be Colin’s 87th birthday on Monday (4th) and their 65th wedding anniversary this Thursday (7th), fabulous – congrats. It will also be bass player Ted’s wife, Francis’ birthday too (on Wednesday 6th) I believe Francis is about my age – 30several and a bit more! So the band returned and played ‘Happy Birthday’ to them all. (by-the-way, Jo told me she had married a toy-boy as her next birthday (in October) will be her 88th). ‘Hold That Tiger’ (probably played for Jo) is another exciting tune, sung by Les, with wonderful solos from Tim and Ted and surely the whole band were exhausted at the end of this one. This tune is apparently another old American high school ‘fight’ song. Now dear ol’ Mike performed to my next song choice – and I mean ‘performed’. 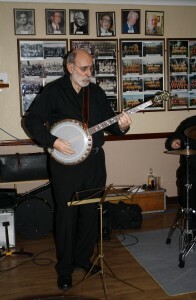 He ‘spoke’ all the famous lines of ‘Ashes to Ashes’ just superbly, which lead on to them playing ‘Didn’t He Ramble’. They played fabulously, I can’t fault anyone as they were all so good. Their last number was ‘Down By The Riverside’, ending another thoroughly wonderful evening full of great talent and lots of laughs. Sorry, no photos, Mike is still away, and although I took some photos with my very old mobile phone, they are ‘trapped’ in it and will take me a time to work it out again!, Although don’t hold your breathe as to what they will be like. Anyway, keep coming for more jazz! We have a different band here every Friday evening. P.S. Yerba Buena Jazz Band Newsletter of 26th June 2015 has now been updated. This entry was posted in Mike Barry’s XXL Band on July 4, 2016 by Diane. 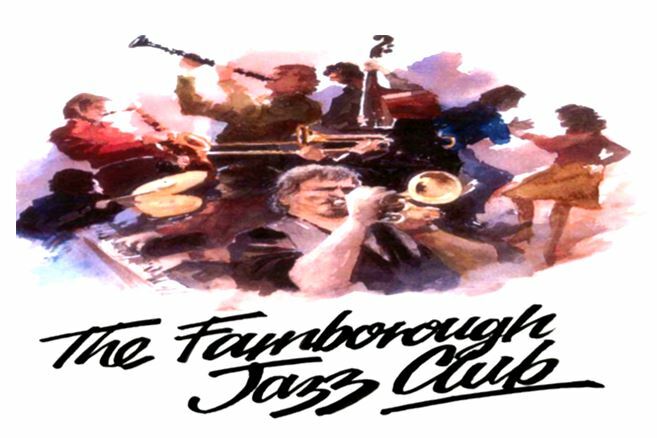 The Farnborough Jazz Club proudly presented MIKE BARRY’S XXL JAZZ BAND on Friday, 7th February 2014. 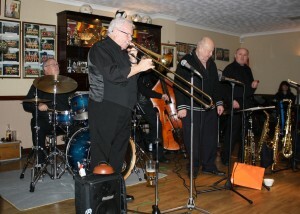 The band’s leader and trumpeter Mike, had with him reeds player JOHNNY ROGERS, trombonist REX O’DELL, pianist GRAHAM BARTON, double bassist ROGER CURPHEY and drummer PAUL BUDD. Our audience certainly jazzed it up on the dance floor! Everyone said what a fantastic band and consequent evening it was, whether dancers, or not. Now let’s tell you how the evening’s fun occurred. My first jotting was of ‘Basin Street Blues’. Mike sung this one and Roger played double bass with a bow, gorgeous (the playing – not Roger – although he is too, ha). Rex sang ‘Everybody Loves My Baby’. Then that great song ‘Saint Louis Blues’ came next (which was said to have inspired the Foxtrot dance). It was sung by Rex, with Johnny playing sax. Then Johnny sang ‘Keeping out Of Mischief Now’. He has been suffering with tonsillitis, but he did a marvellous job. Now the next song was called ‘My Bucket’s got a Hole in it’, famed by Hank Williams and later in 1970 by Louis Armstrong. Mike and Rex sung in harmony, managing to interject a bit of ‘You Keep a-knocking, But You Can’t Come In – fantastic. Mike then sang ‘Marching through Georgia’. After that, Graham featured on piano, with his brilliant composition of boogie woogie and we named it ‘Graham’s Boogie’. Everyone got up to dance and all of us completely let our hair down too. Fancy following that, but Rex did, by singing, in the inimitable style of Louis Armstrong, to ‘Aint Misbehaving’ and then to put the icing on the cake came ‘Dr Jazz’ sung by Lil Hardin (Louis Armstrong’s second wife) nah, I’m sure they announced it wrong, surely it WAS Johnny, sounded like Lil though! What a lovely lot of fun. Next date for Mike’s XXL Band is 26th September 2014. Hope to see as many as possible next Friday. This entry was posted in Mike Barry’s XXL Band on February 12, 2014 by Diane. 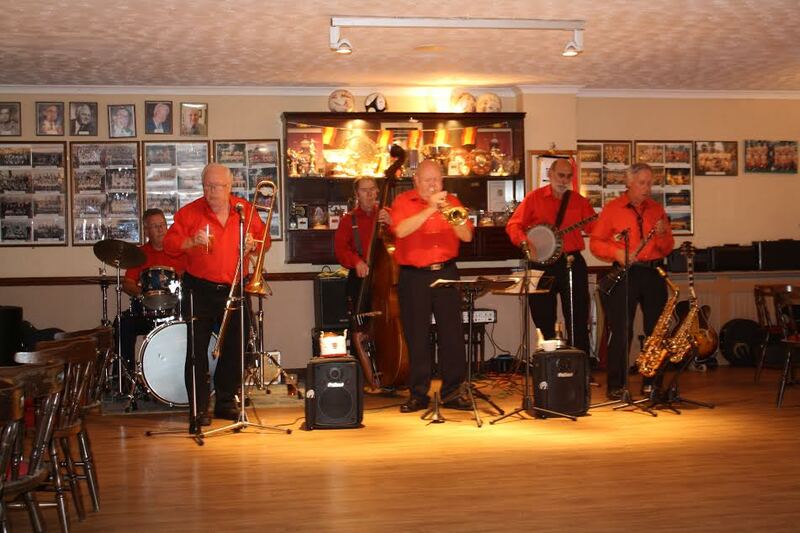 MIKE BARRY’S XXL JAZZ BAND, returned here at Farnborough Jazz Club on Friday, 27th September 2013. Leader and trumpeter Mike had a bad time getting to us due to his new car not starting, but you would never had known it! 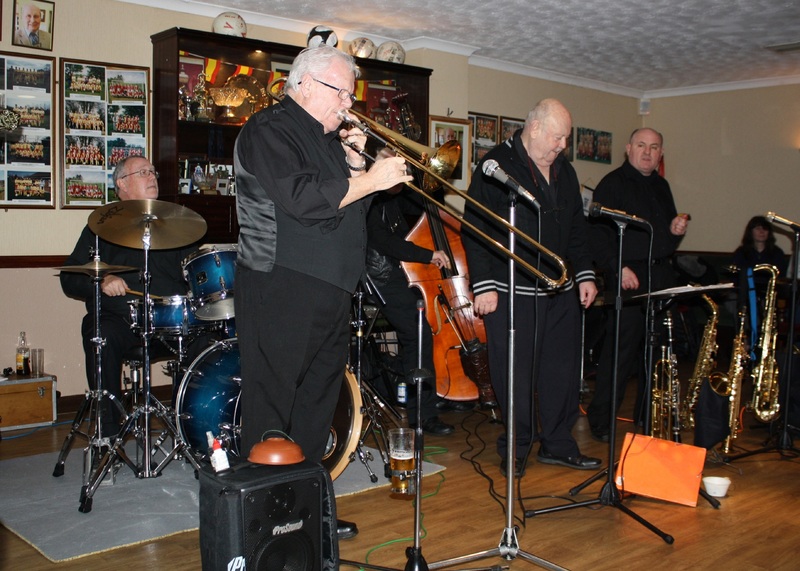 He proudly introduced his band as reeds player GOFF DUBBER, trombonist REX O’DELL, pianist TIM HUSKISSON, double bassist ROGER CURPHEY and drummer PAUL BUDD. 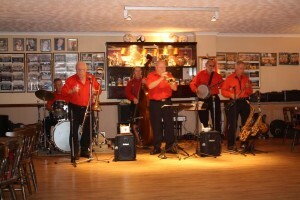 As mentioned last week, they are certainly a swinging, fun filled lot and the evening went well. Mike reminds me of Paul Whiteman and certainly should have been as successful. I hope Mike doesn’t take exception to me saying this, because I’m not sure why I think so, especially as PW only played violin/viola. Maybe I feel he should have played trumpet, being a band leader! We had some lovely numbers played for us, such as ‘I Wanna Say Hello’, ‘The Jazz Me Blues’, ‘River, Stay Away From My Door’ (which was sung by Mike) and ‘Riverboat Shuffle’. I just loved how the next number ‘Georgia on My Mind’ was sung up-tempo by Rex, and Mike gave a marvellous rendition on trumpet too. I jotted down that everyone played wonderful solos especially Roger, to the following number ‘If My Friends Could See Me Now’, (Shirley MacLean’s song in film ‘Sweet Charity’). It certainly lured the dancers out. They also played ‘Brown Skin Girl’, which was a great calypso number made famous by Harry Belafonte. I just love a calypso. Another dance and (I‘m sure you can guess) audience participation occurred with ‘Everybody Loves Saturday Night’, great fun. The next number to mention was the brilliant feature of Tim. He played ‘You Took Advantage of Me’, which showed his massive talent (his other hat is as a fabulous clarinettist). Our line-dancing occurred next with ‘Dr Jazz’. I always ‘play up’ continuing with the Charleston, which sometimes ‘throws’ the other liners (just for a bit of fun). Well thank you Mike and gang, we had a small crowd, but we all enjoyed ourselves. They are back 29th November 2013, so make a note in your diaries and let’s give them a bigger welcome with a larger audience please. This entry was posted in Mike Barry’s XXL Band, Uncategorized on October 1, 2013 by Diane.